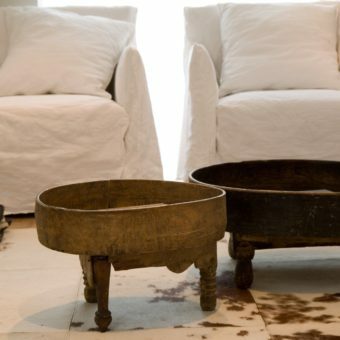 A startling combination of style, comfort and individuality. 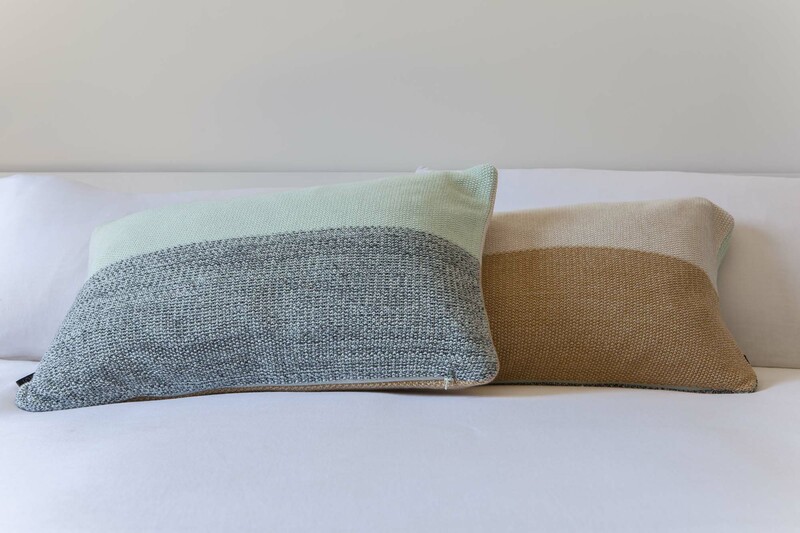 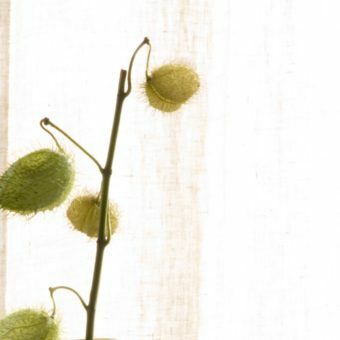 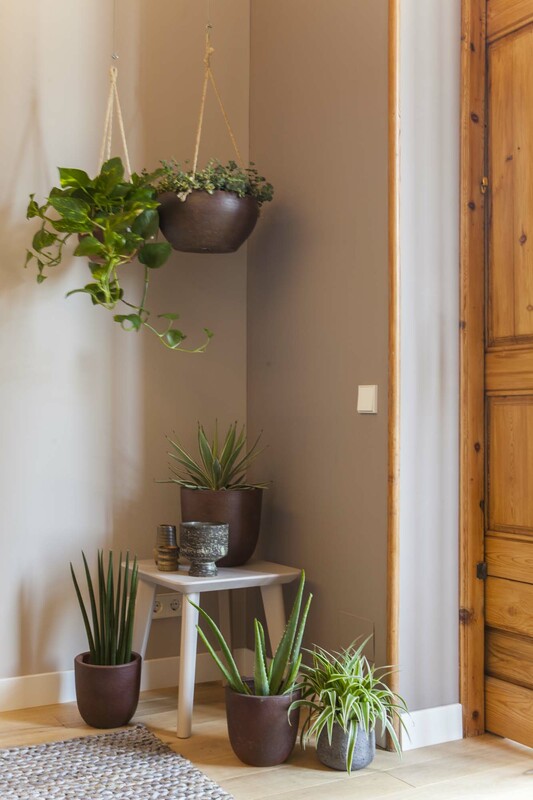 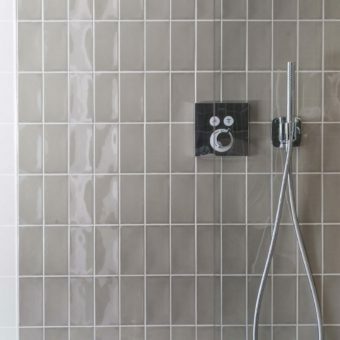 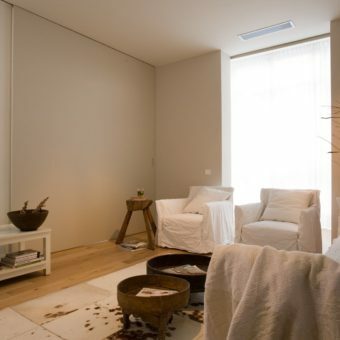 A colour scheme of warm greys, sage, mint and white – coupled with a wonderfully light and a spacious feel. 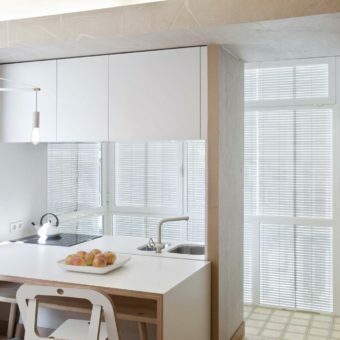 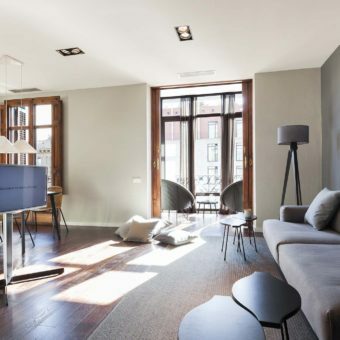 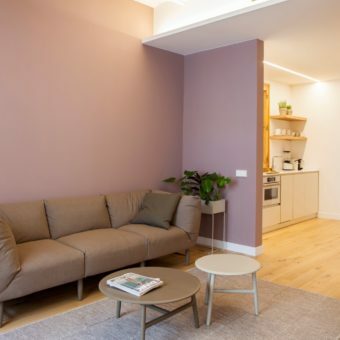 Whether you are here for business, study or simply to experience living in Barcelona like a local, relaxation and quality of life is guaranteed in this 85m2 / 915 sq feet, two bedroom / two bathroom apartment located on the 5th floor. 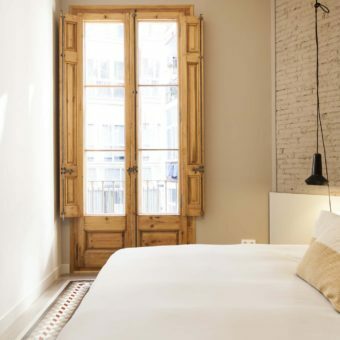 Original details such as French windows, the spectacular bay window and exposed brick walls have been carefully restored. 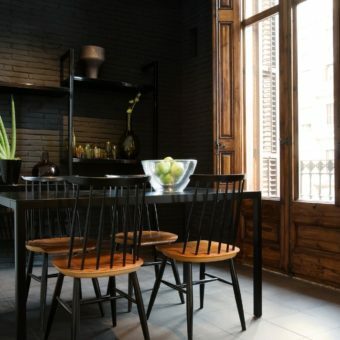 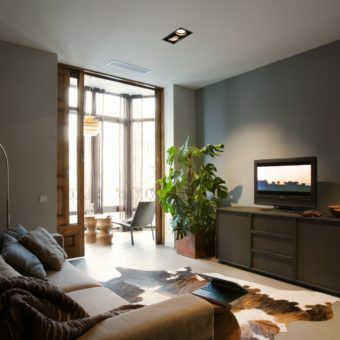 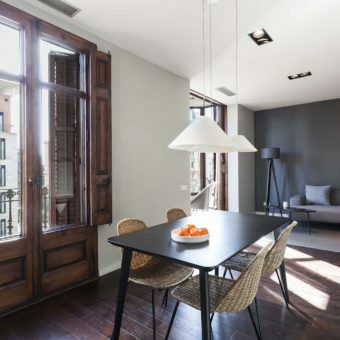 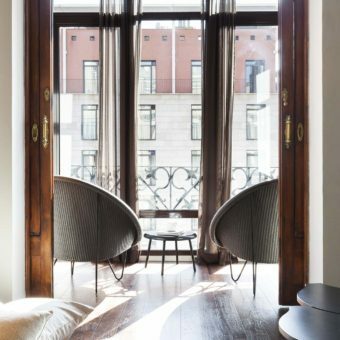 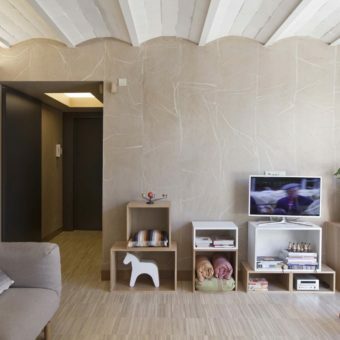 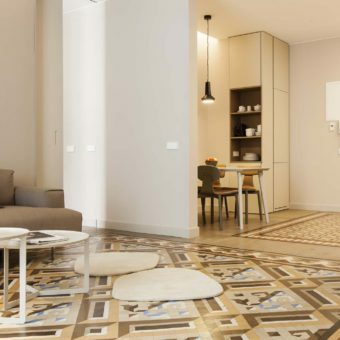 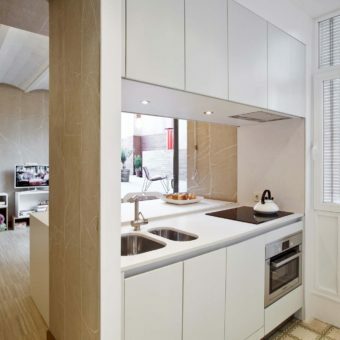 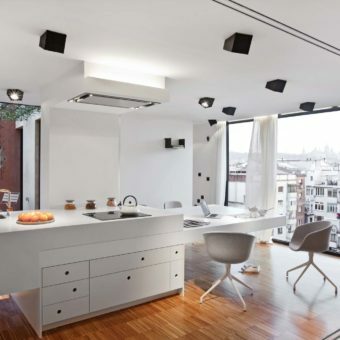 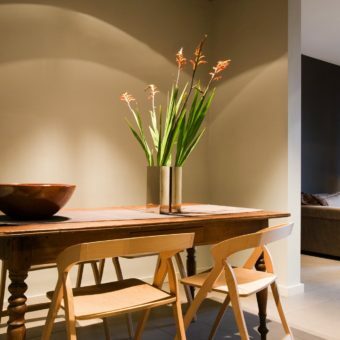 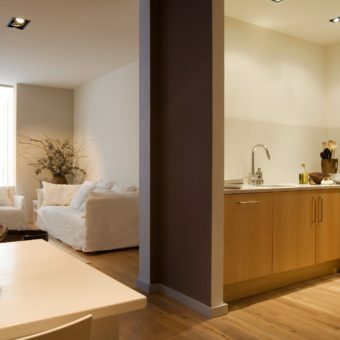 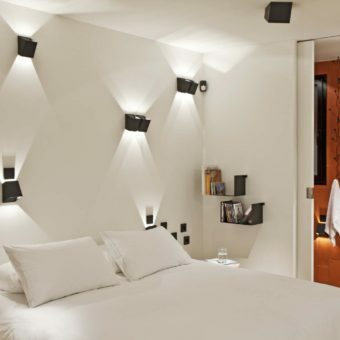 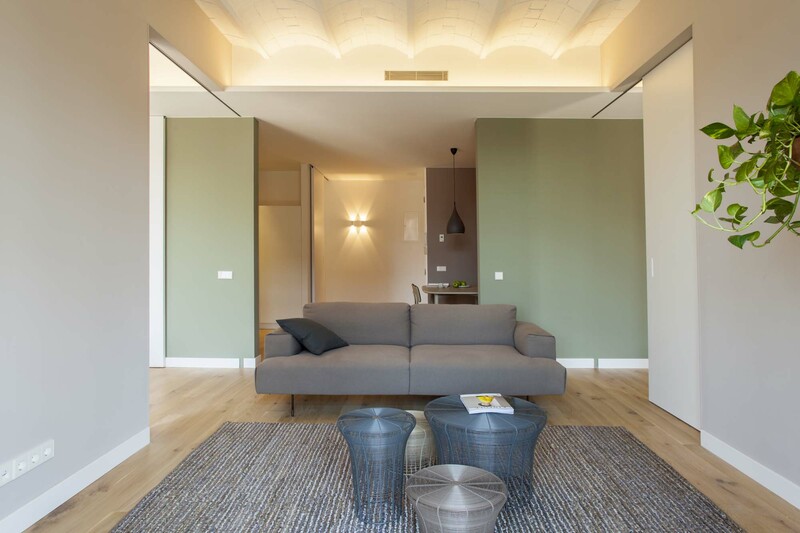 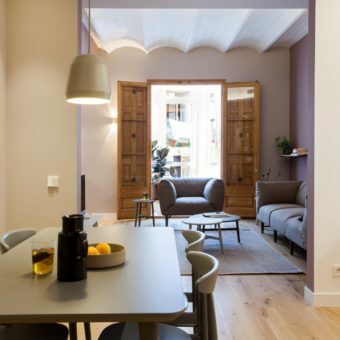 These timeless and beautiful features within this apartment add class and a unique style that is truly Barcelonese. 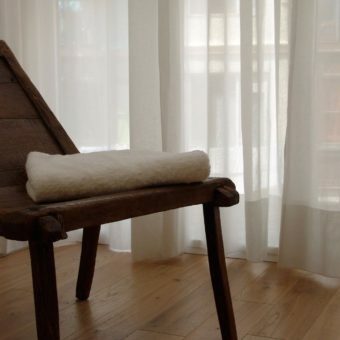 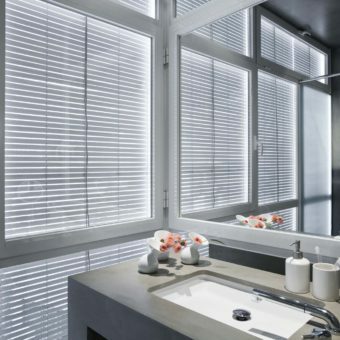 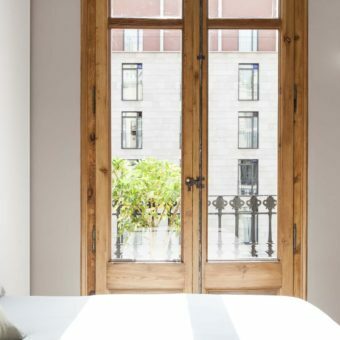 All windows have double glazing and wooden shutters, so you can shut the sounds of city life out whenever you want. 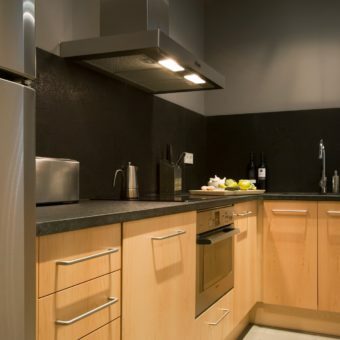 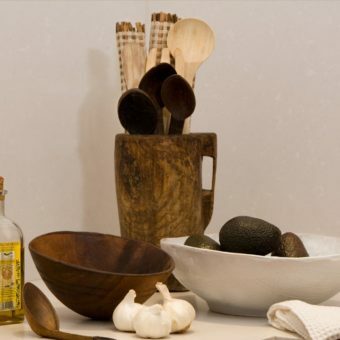 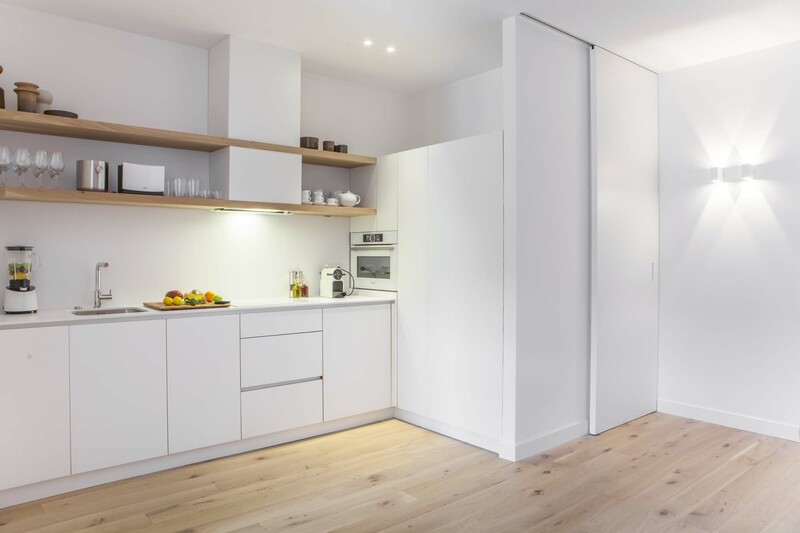 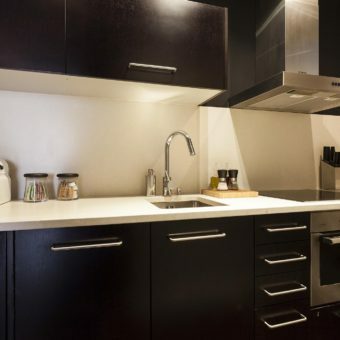 The open kitchen is fully equipped with all the appliances and cooking utensils you might need to prepare a succulent meal or light snack. 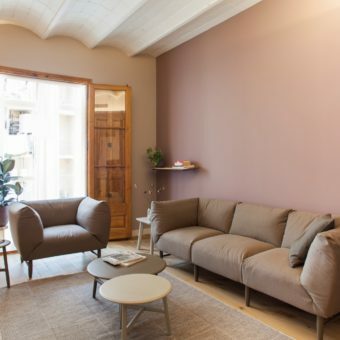 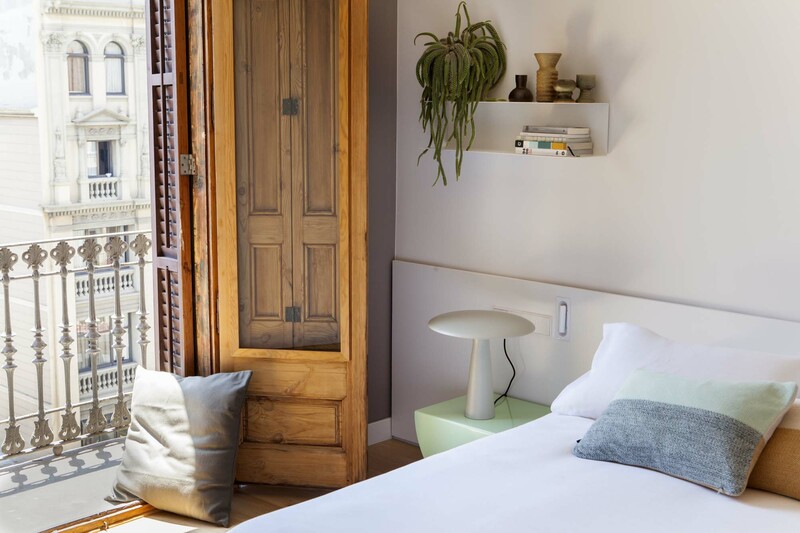 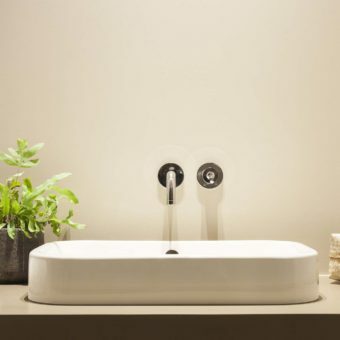 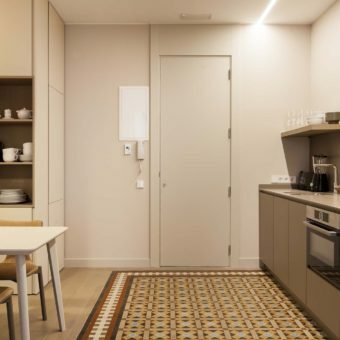 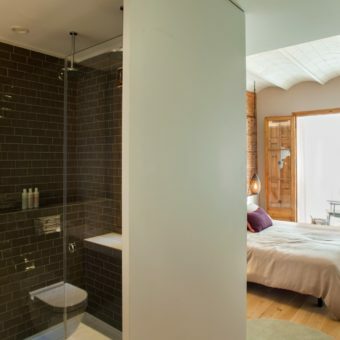 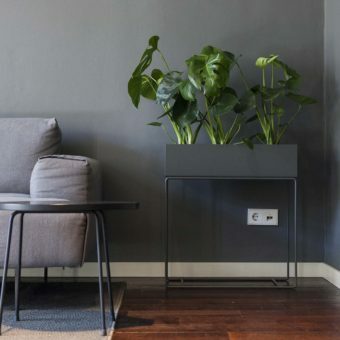 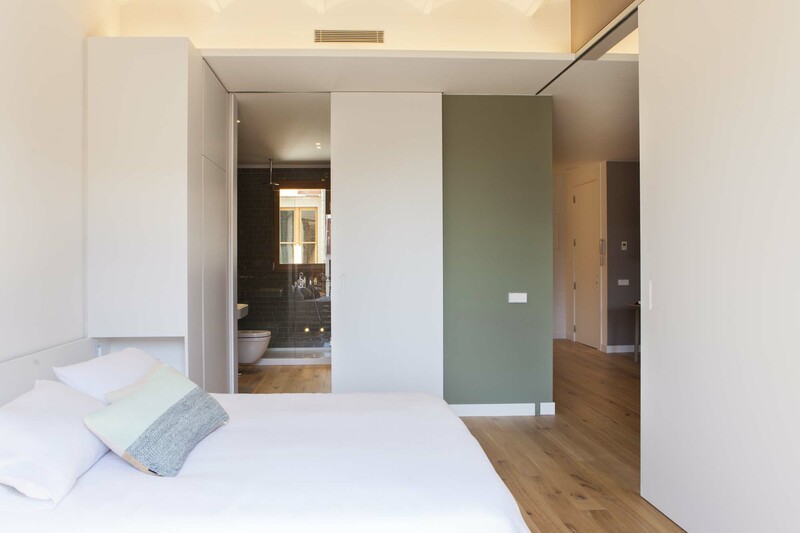 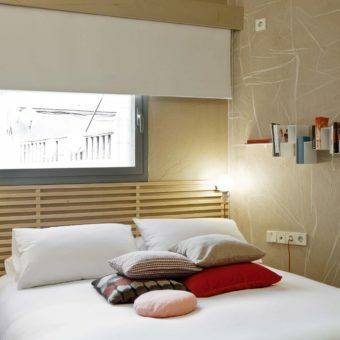 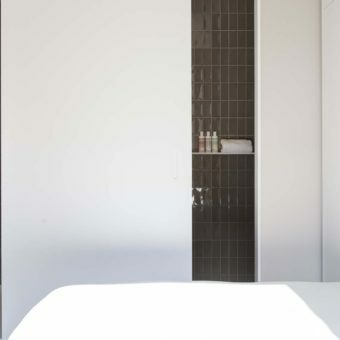 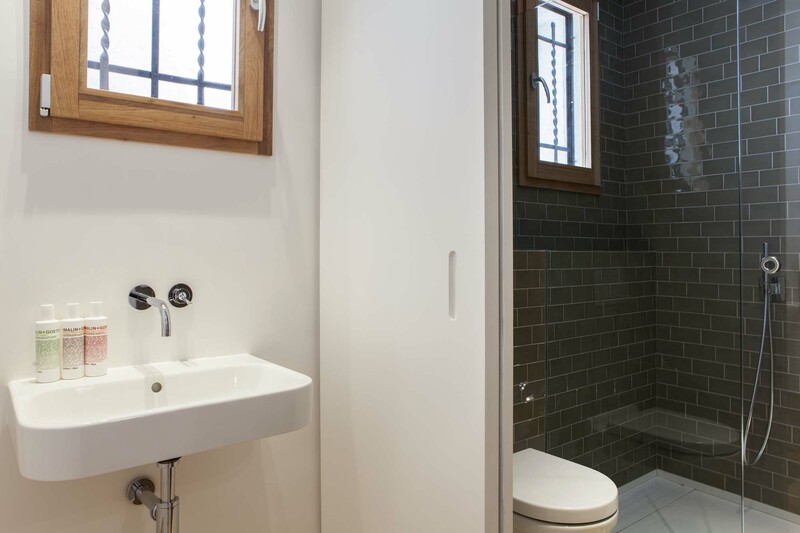 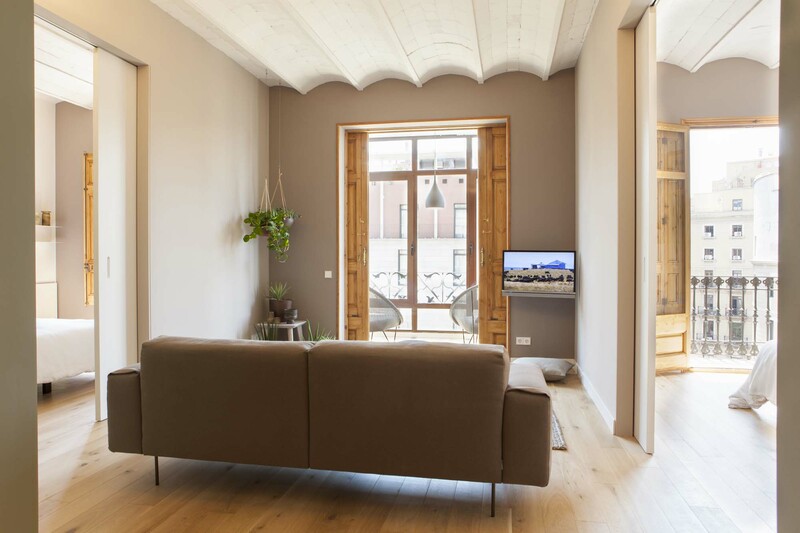 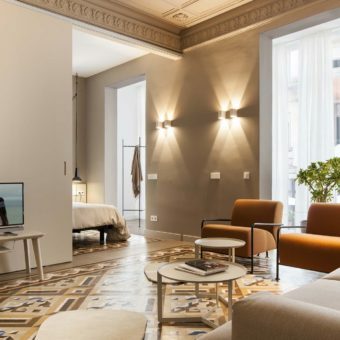 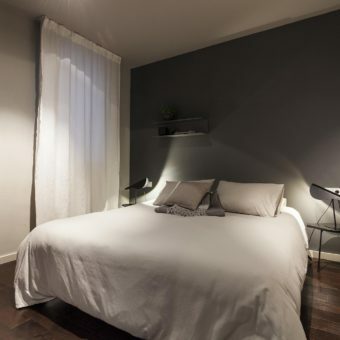 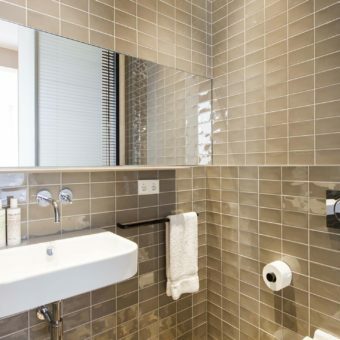 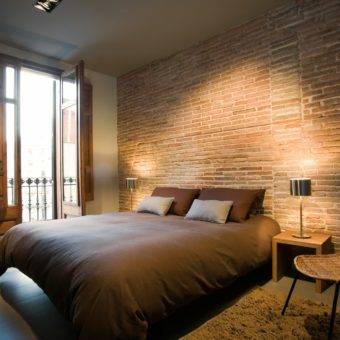 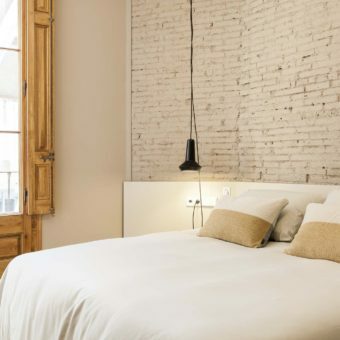 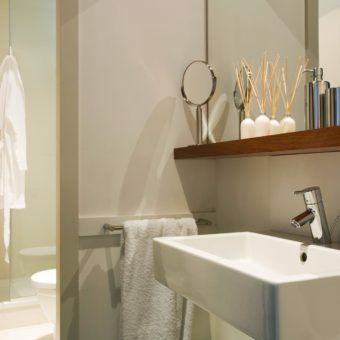 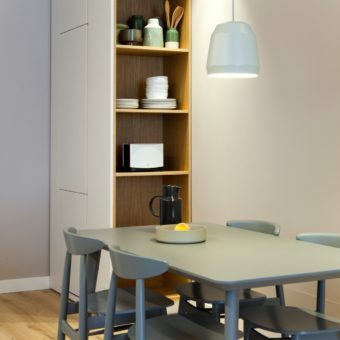 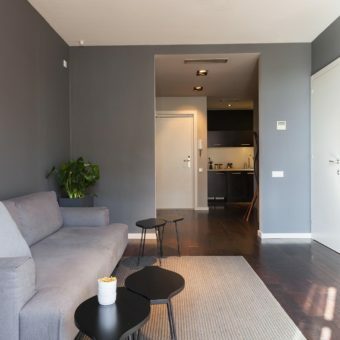 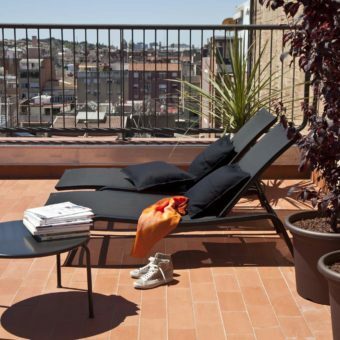 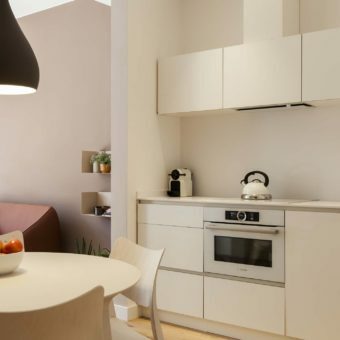 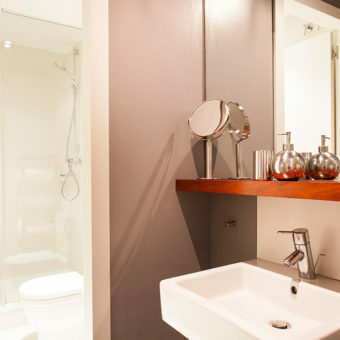 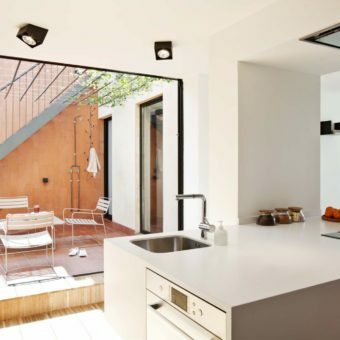 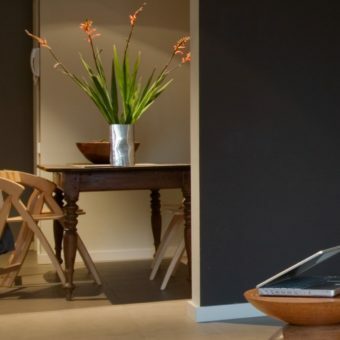 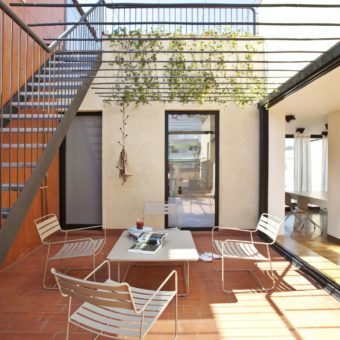 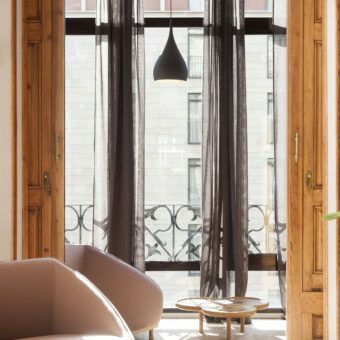 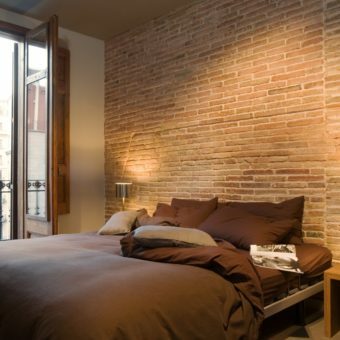 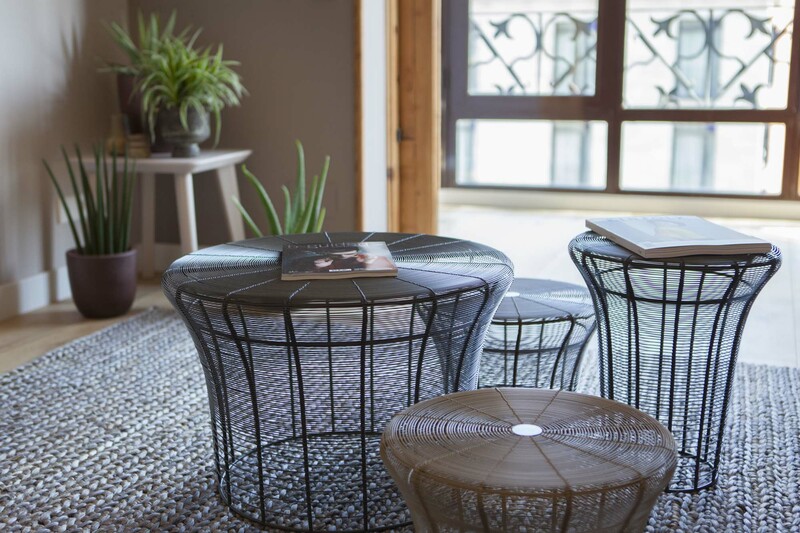 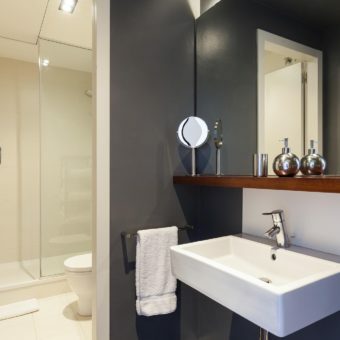 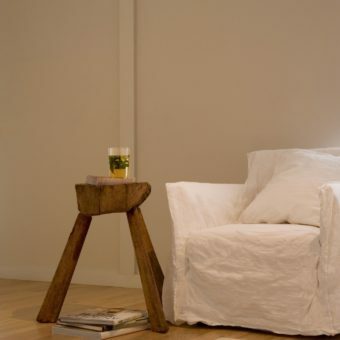 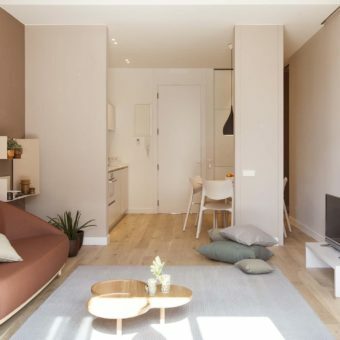 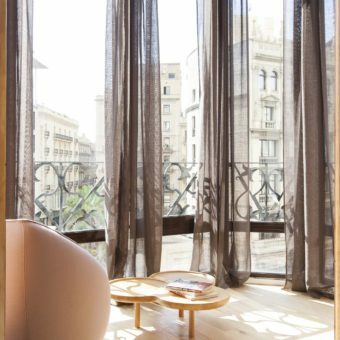 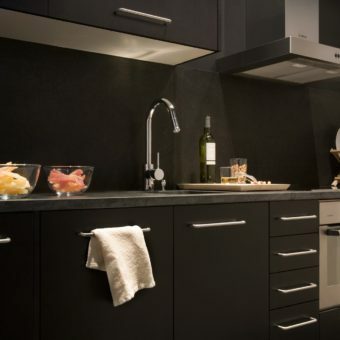 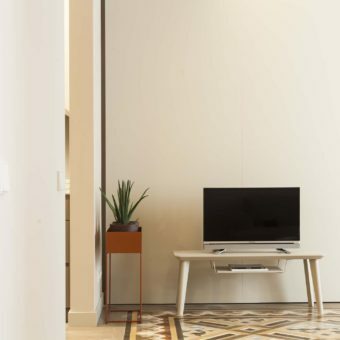 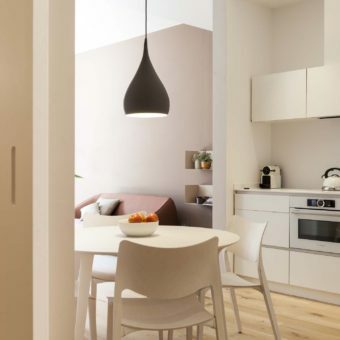 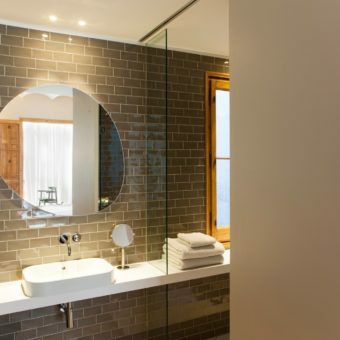 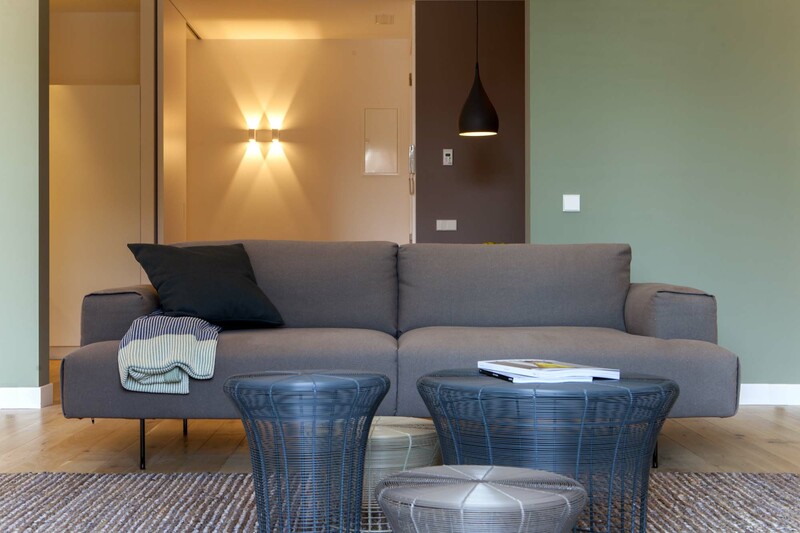 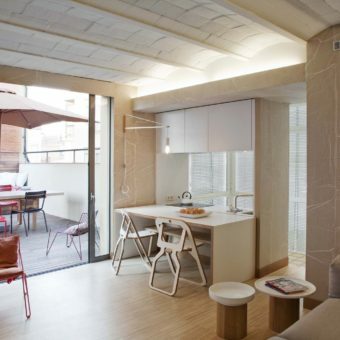 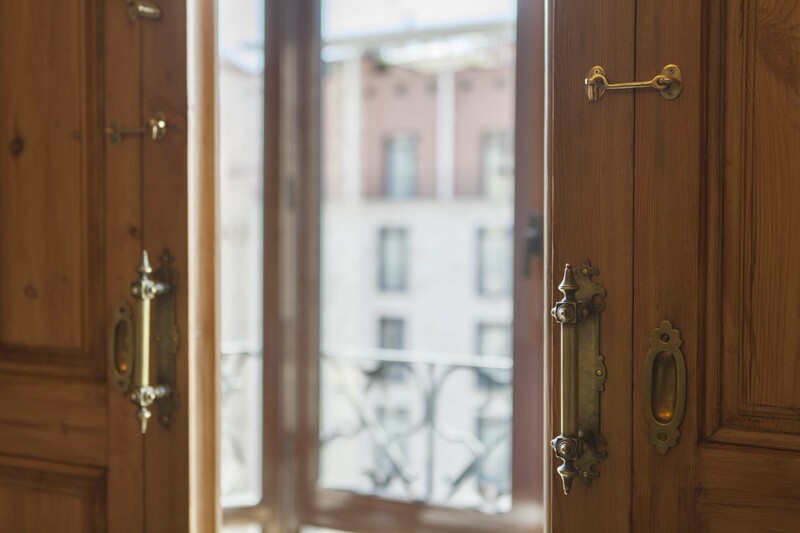 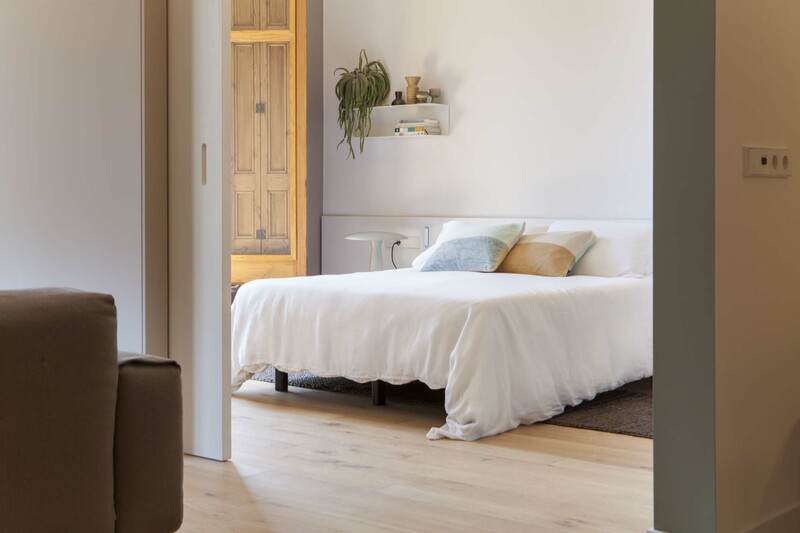 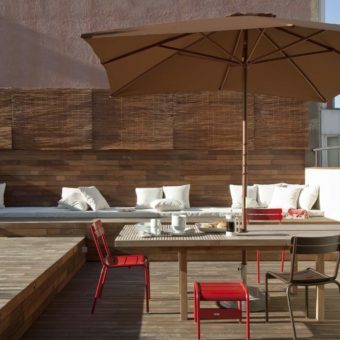 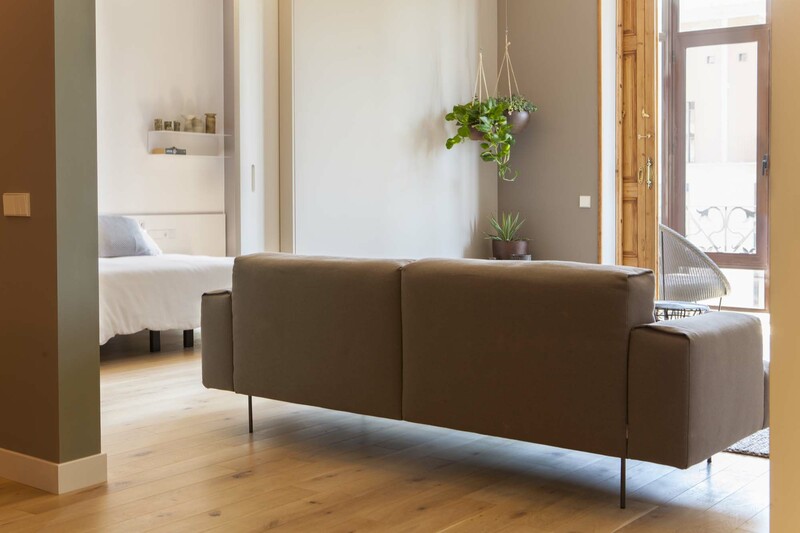 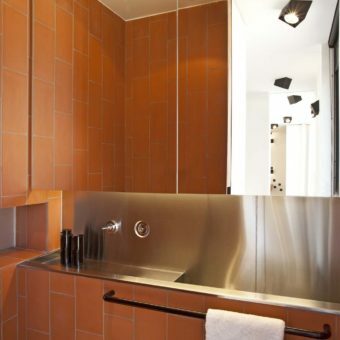 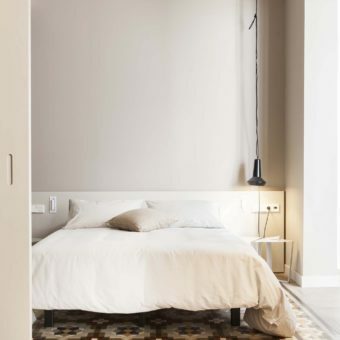 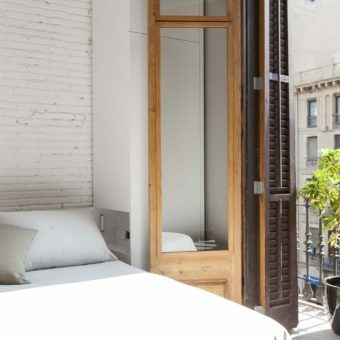 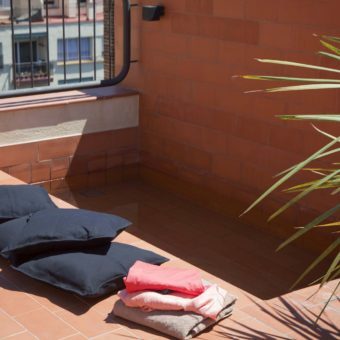 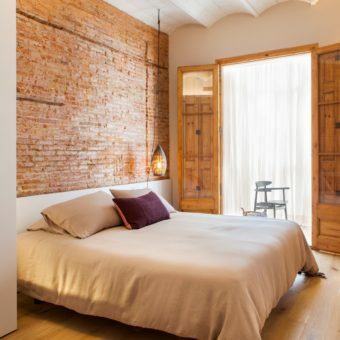 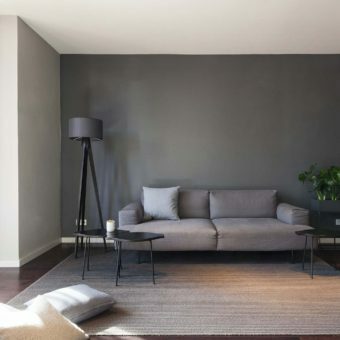 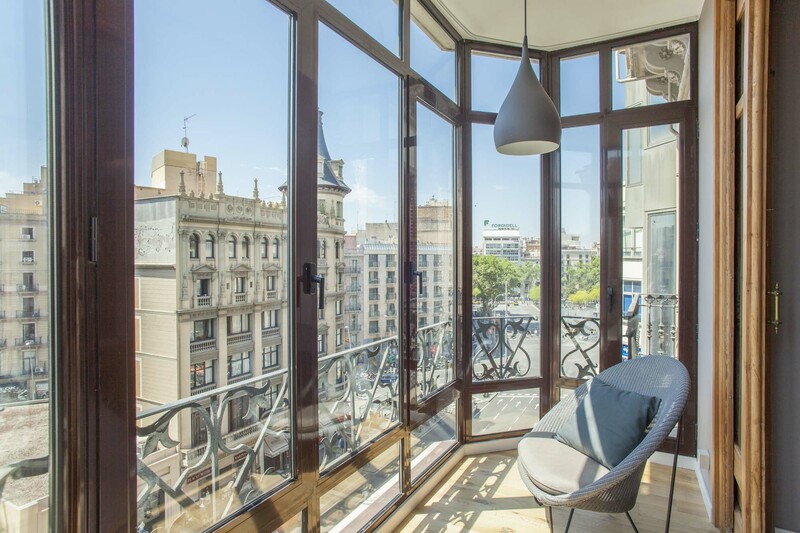 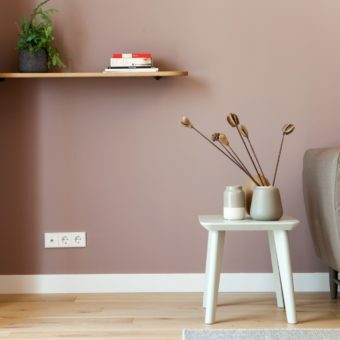 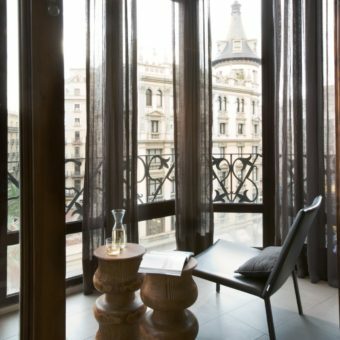 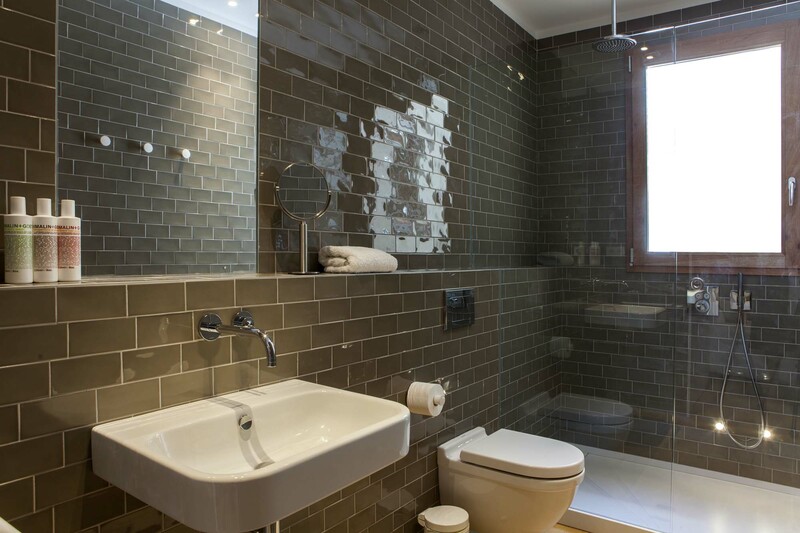 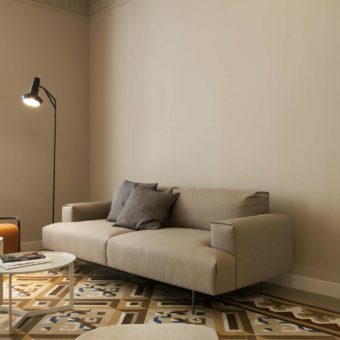 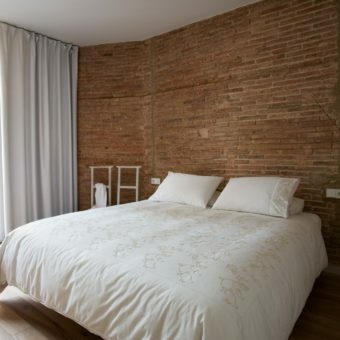 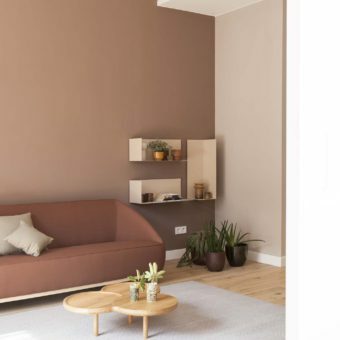 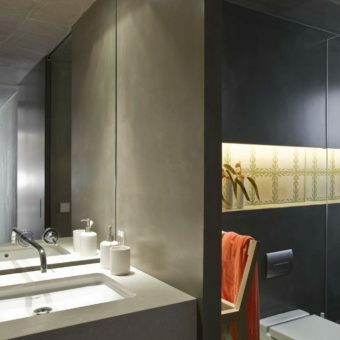 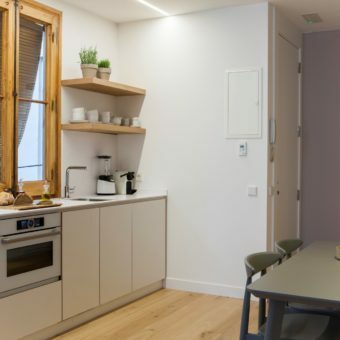 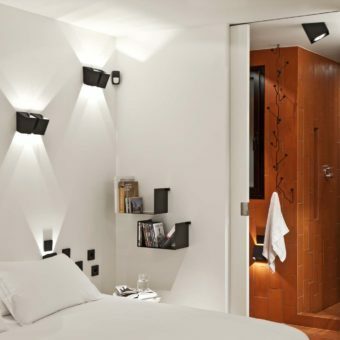 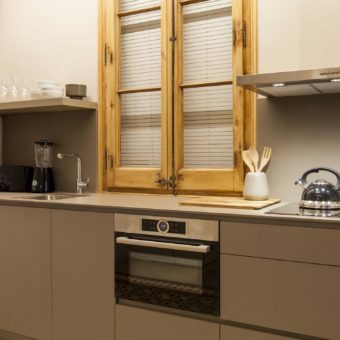 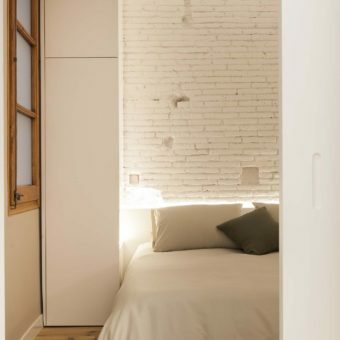 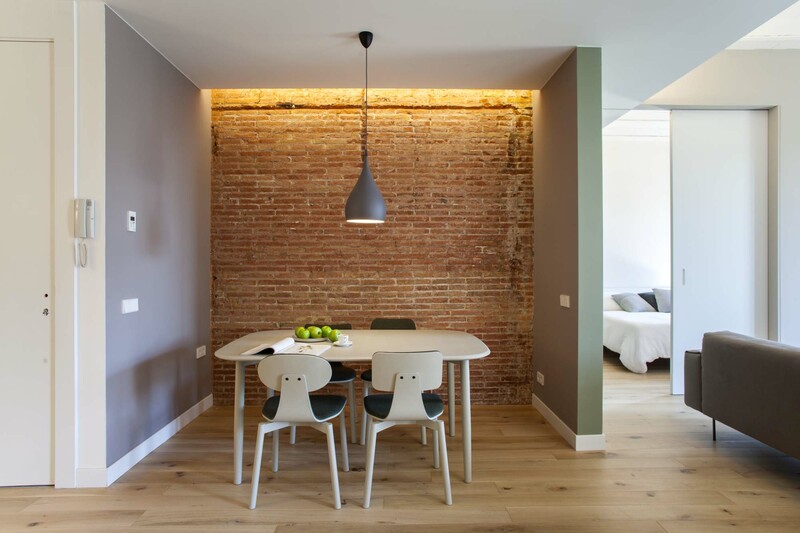 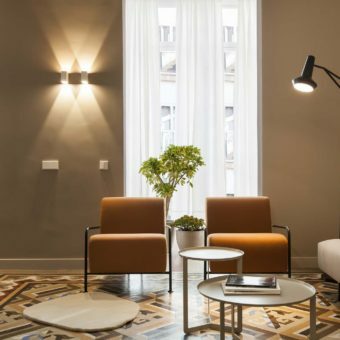 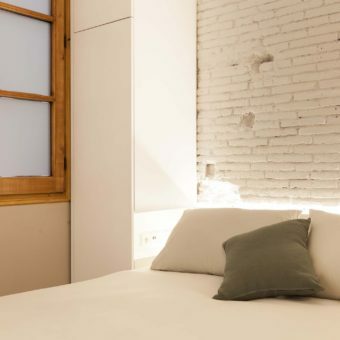 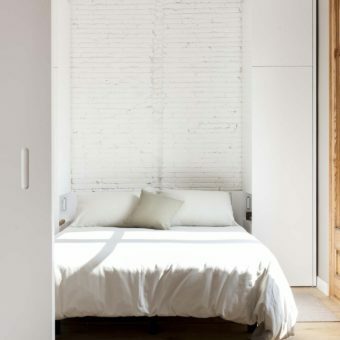 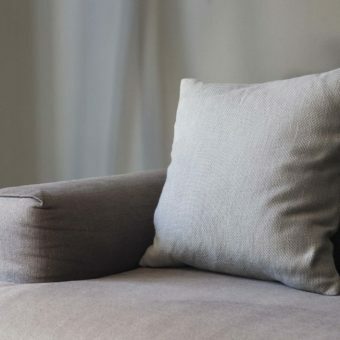 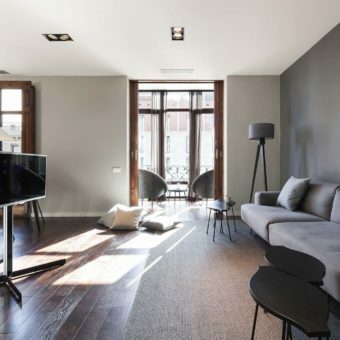 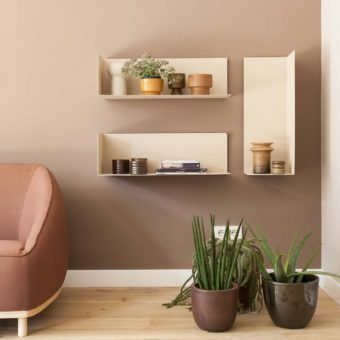 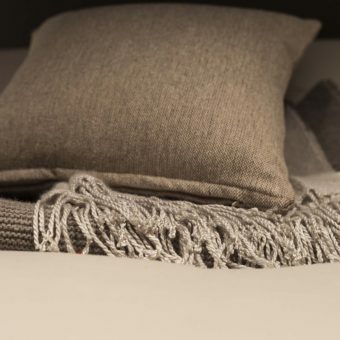 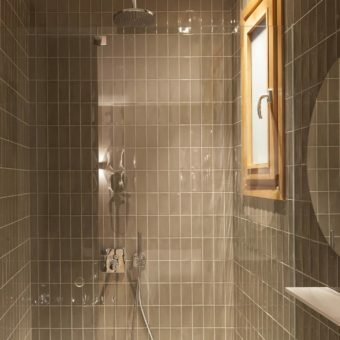 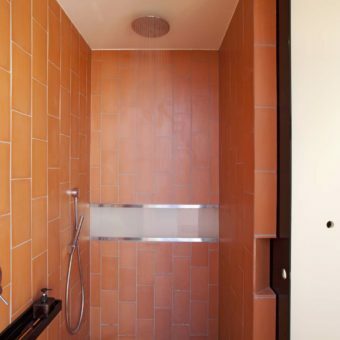 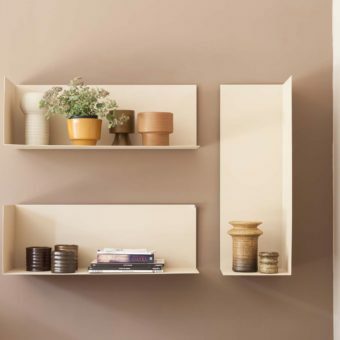 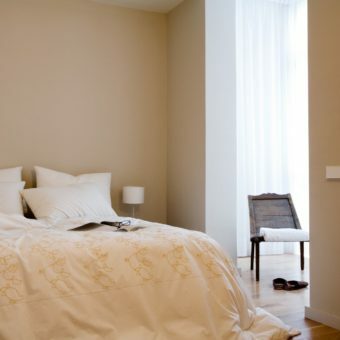 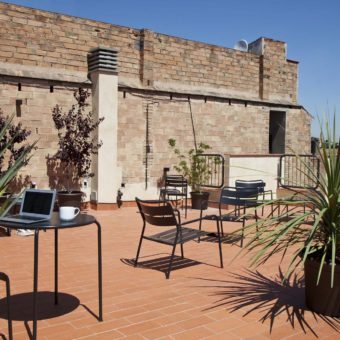 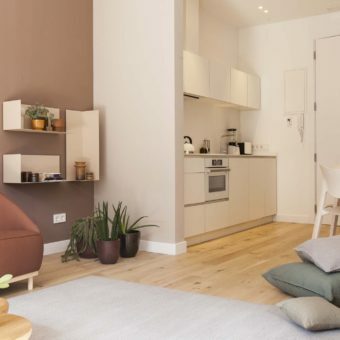 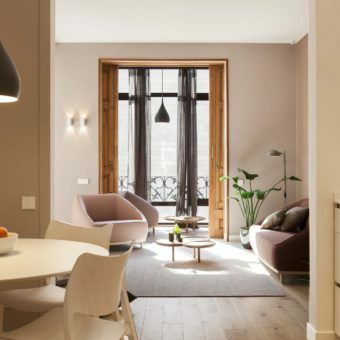 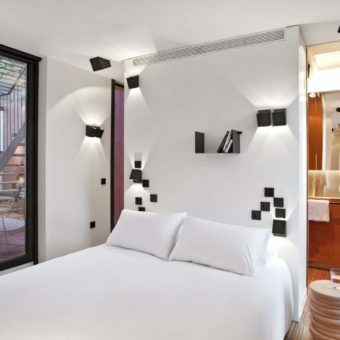 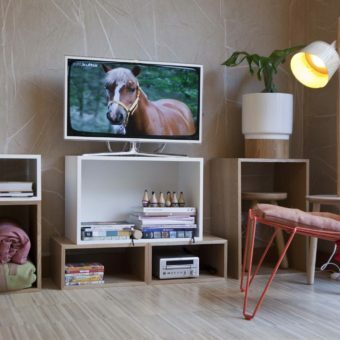 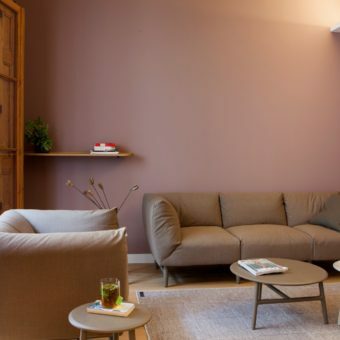 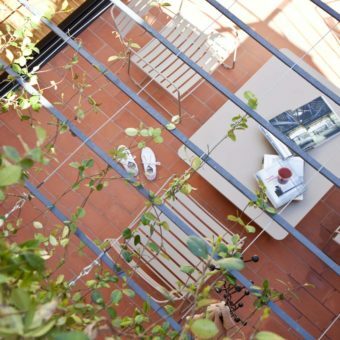 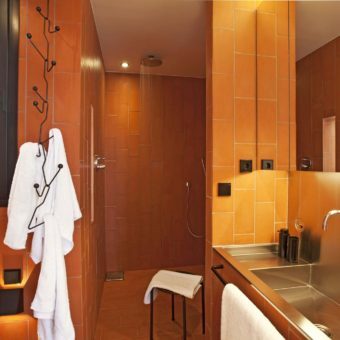 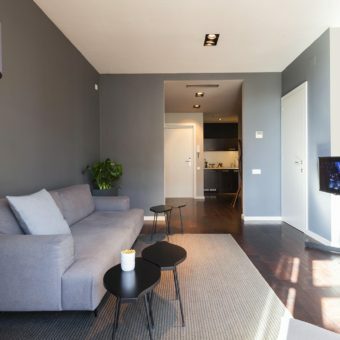 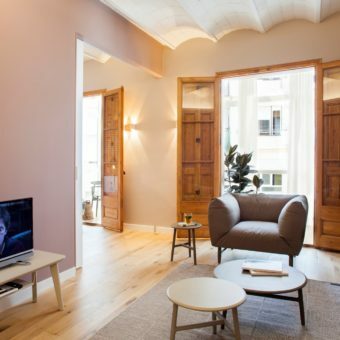 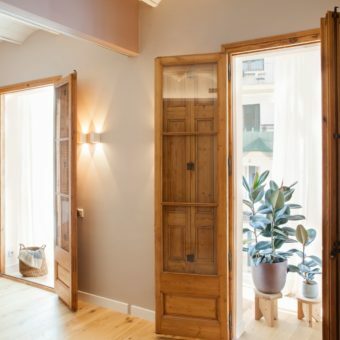 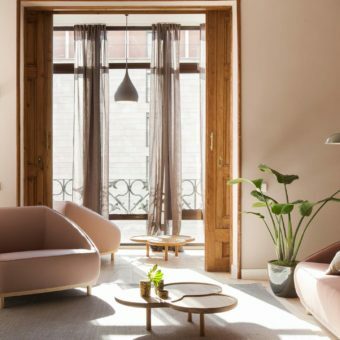 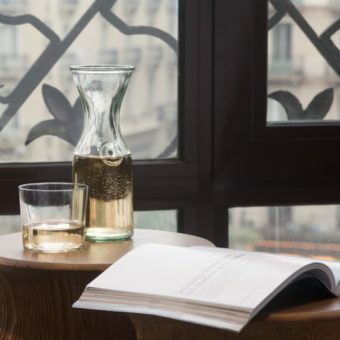 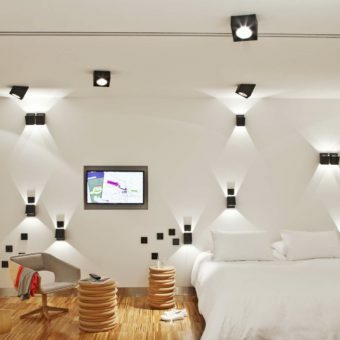 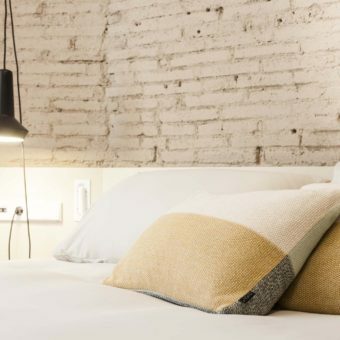 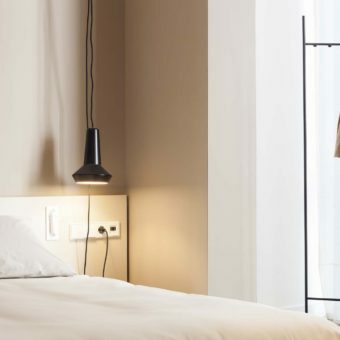 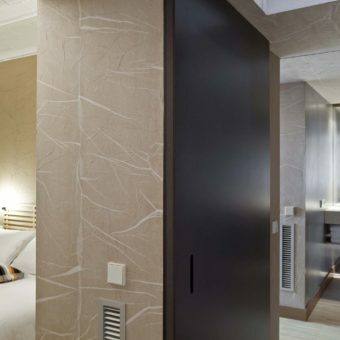 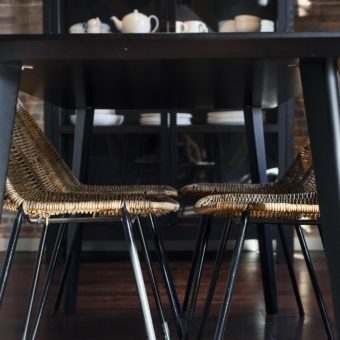 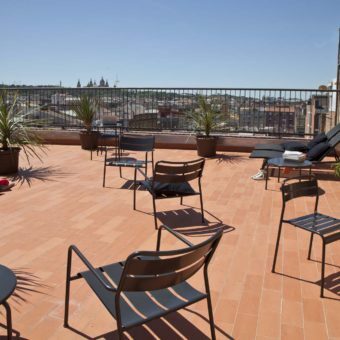 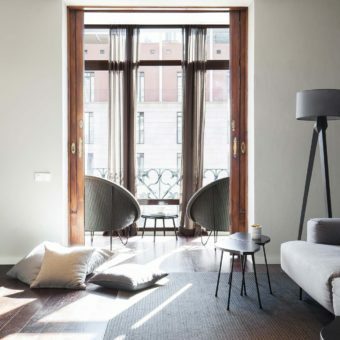 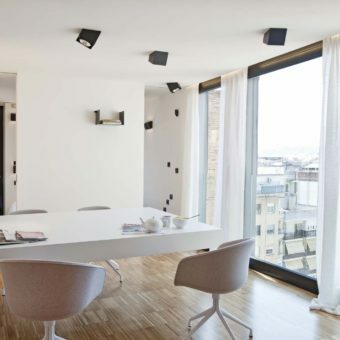 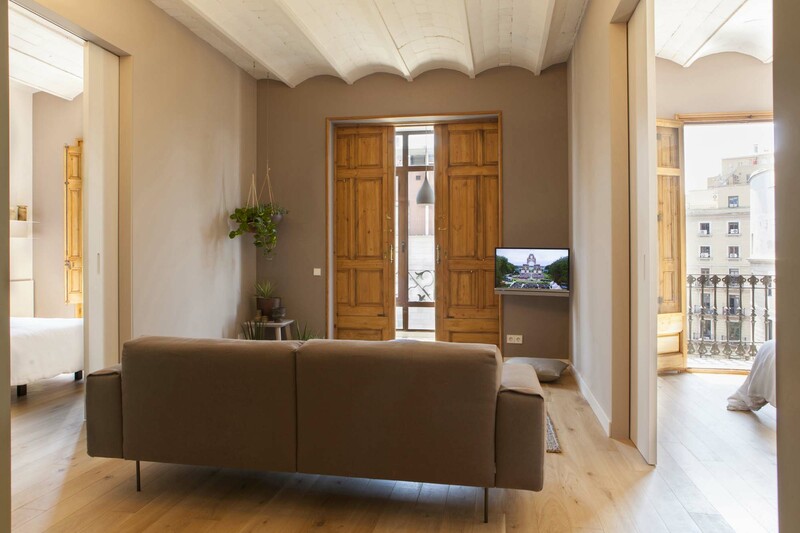 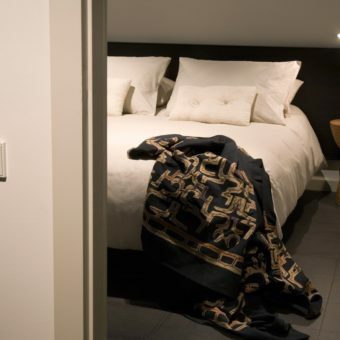 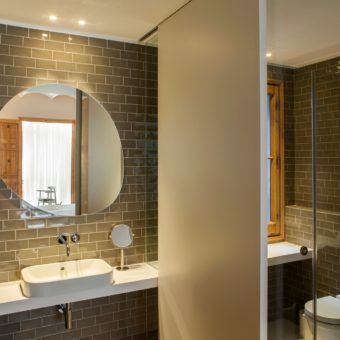 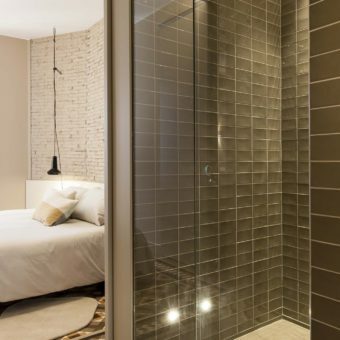 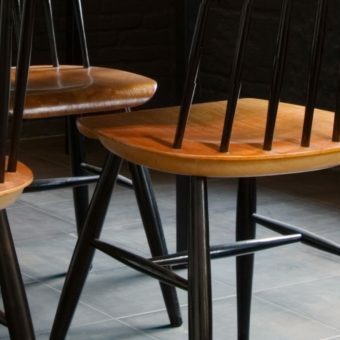 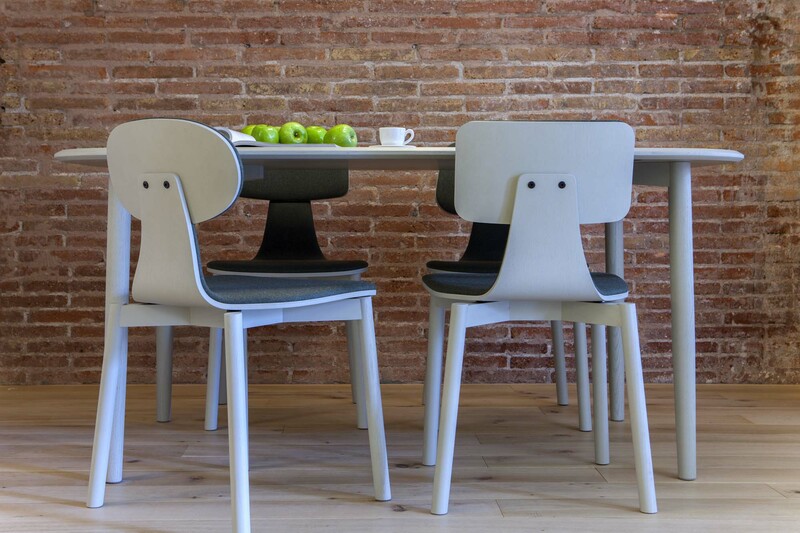 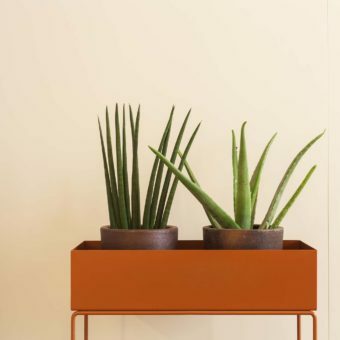 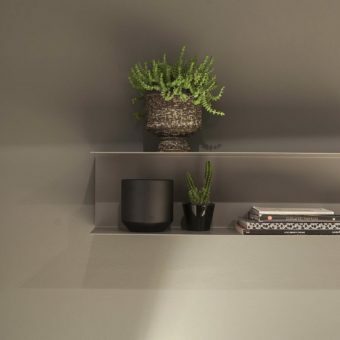 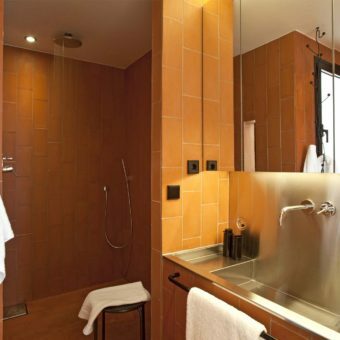 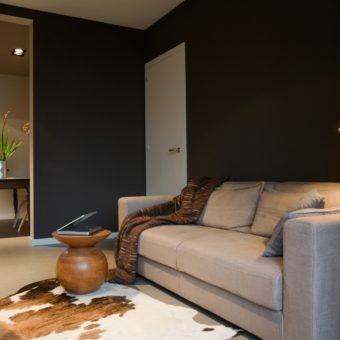 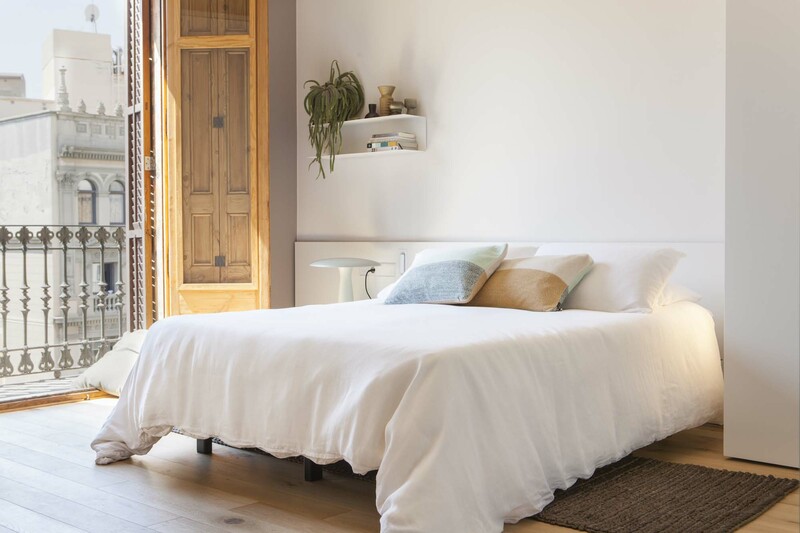 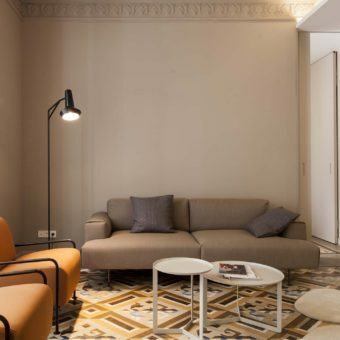 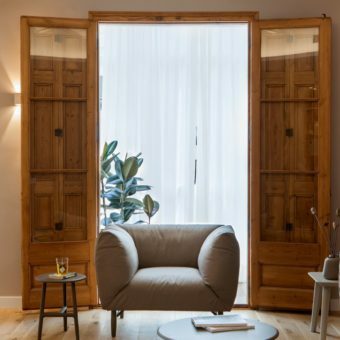 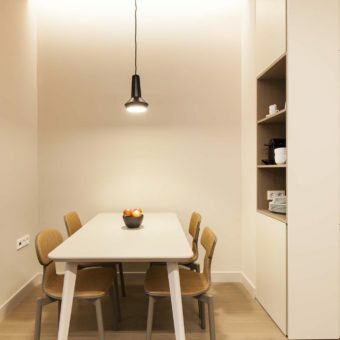 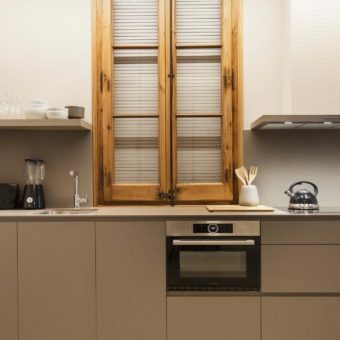 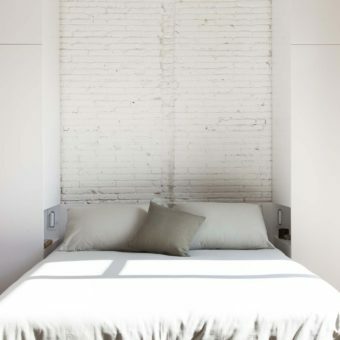 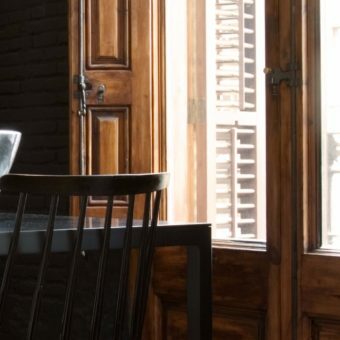 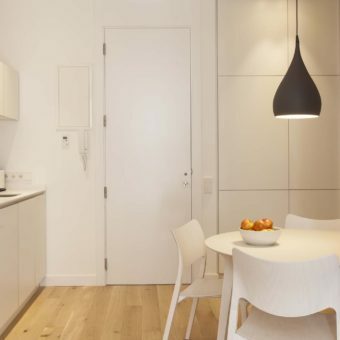 Situated right next to Placa Catalunya – Barcelona’s main hub – the Nudo apartment is the perfect base for exploring the city Directly to the east of this is the vibrant Gothic Quarter and next to it the artistic Raval district. 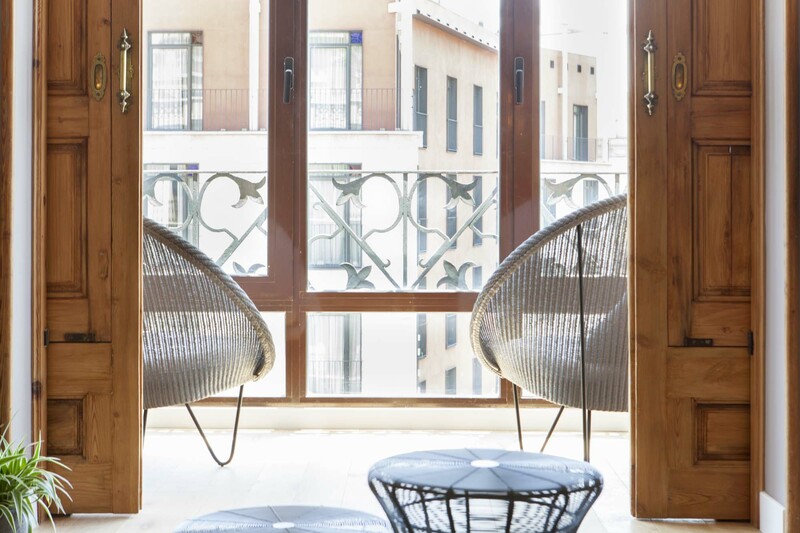 Head north and you’re in the glorious Eixample district, gazing at Gaudí’s architecture and high-end fashion stores. 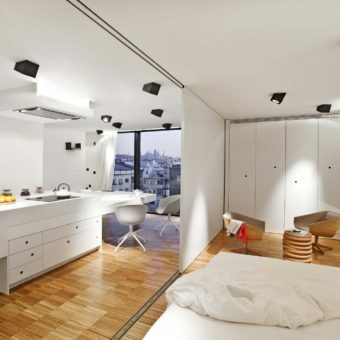 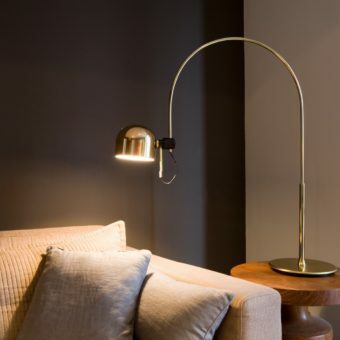 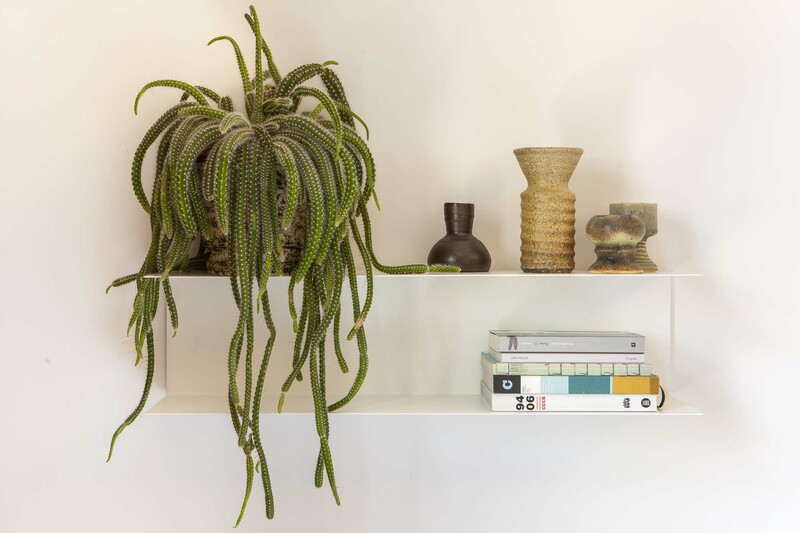 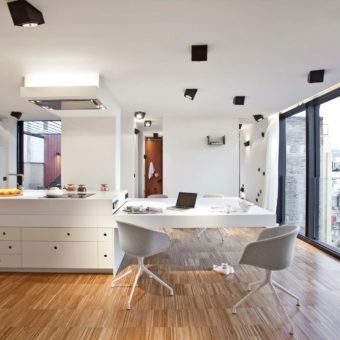 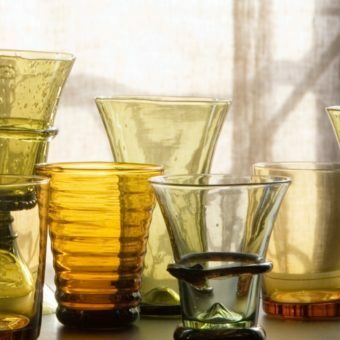 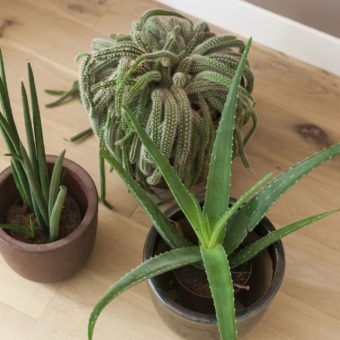 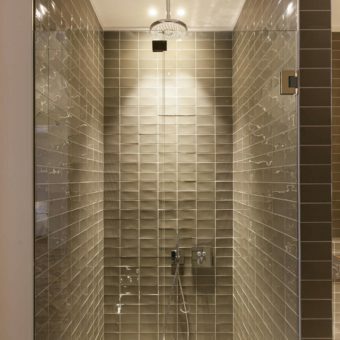 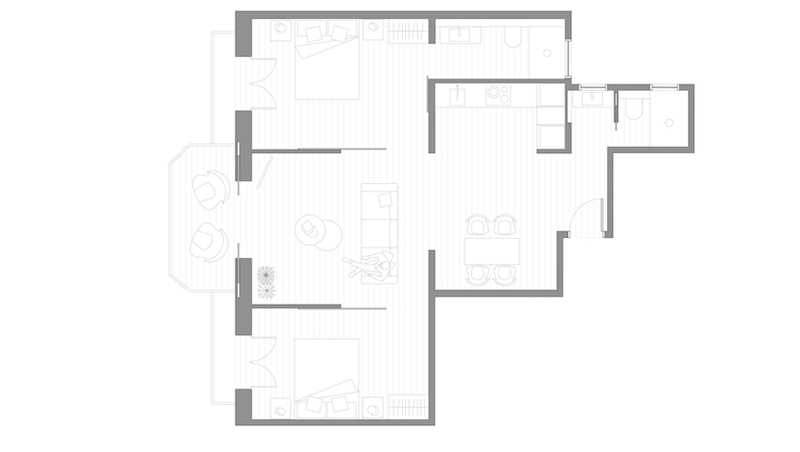 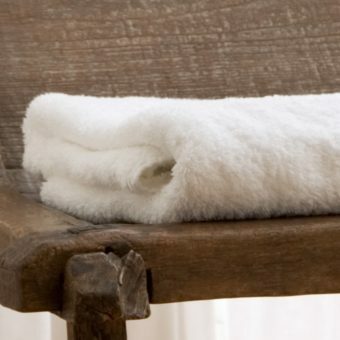 Living in the Nudo apartment means getting the best of both worlds. 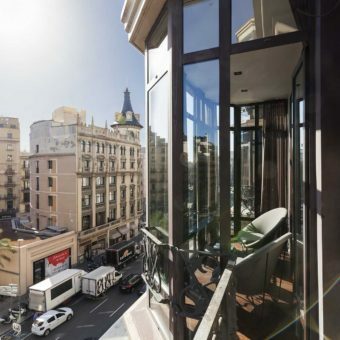 Just a few steps up, you’re in the classy Eixample district. 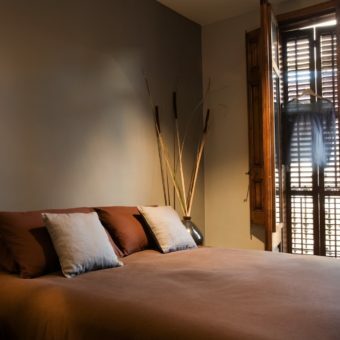 Venture east and instantly you’re surrounded by history in the Gothic quarter, or Barri Gòtic.